St Patrick’s Day is just around the corner and for many, so are pints of Guinness, shamrock hats and a bit of the craic. We’ve compiled some tips for Paddy’s Day that allows your social media to shine when everyone else is having a grand old time. If you’re hoping to really nail St Patrick’s Day on the head then a mixture of relevance and imagery should see you come to the fore. We’ve previously blogged about the impact that images have on engagement as opposed to other forms of posts and a day like this is the time to use them. St Patrick’s Day is a light hearted affair, so a little bit of humour can go a long way. It also falls on the weekend, so remember that’s the best time for engagement levels. Music is also a large part of the day at hand, so why not compile a Facebook linked Spotify playlist of the new, the old, the fast and the slow and then share it on your Facebook page or blog. Your fans or followers with Spotify can then just click through and listen to your selection of Irish tunes for the day at hand. Chances are they won’t have a large selection of The Dropkick Murphys or lesser that The Fureys on their hard drive, so they’ll be thankful. If you’ve a larger business, you always run the risk of becoming some sort of vague corporate entity. 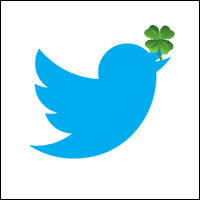 St Patrick’s Day offers you the opportunity to really humanise a brand and give it a face. Videos and photos of your team dressed up in some green garb shows the world you enjoy a party, are human and can be a real benefit to your brand. St Patrick’s Day inspired cover photos work well on most social media platforms, as do any seasonal pictures at the right time of year. Changing your Twitter header and background image, as well as your Facebook and other accounts profile settings to something a bit greener gets people in the mood and gives a friendlier perception of your business. It can be hard to really make the most of Twitter on the day at hand, simply because with over 3,000 Tweets a second, most related #hashtags are going to flood in for the 24 hours of the day at hand. The smart money is on being hyper local with your #hashtags and offering promotions to the local area. Sending #Stpatricksday is merely spam in most instances, so don’t even bother. Of course, St Patrick’s Day is quite a visual celebration, so a Pinterest board of some sort celebrating the day in question can be a good way to give things a lift, especially in conjunction with the new changes within Facebook. Pin interesting images, create value and if there are any issues try and solve them with tips and advice. St Patrick’s Day is a fun celebratory festival, so keep it light, keep it apt and keep it green. My Social Agency is a digital marketing agency with teams in London and Leeds. Get in touch to learn more about our social media marketing services.